The demand within the global market for intraocular lenses has been rising on account of the rising cases of cataract across the world, finds Transparency Market Research (TMR). The market vendors in the global intraocular lenses market have been making ardent effort to provide seamless services to the consumers. Intraocular lenses are used during cataract surgeries, and hence, it is immensely important to ensure high standards of production and quality. The market vendors in the global intraocular lenses market have taken an onus upon themselves to produce high quality lenses. Furthermore, these vendors have formed alliances with manufacturers of other eye-treatment products in recent times. It is expected that the leading vendors in the global intraocular lenses market would capitalise on improving the quality of their lenses. Moreover, acquisition of smaller sellers of intraocular lenses is also expected to be a key strategy for the key vendors. The small-scale vendors in the global intraocular lenses market are concentrating on facilitating technology transfer from established vendors. These small vendors in the global intraocular lenses market are also expected to form alliance in order to sustain in the market. Some of the key vendors in the global intraocular lenses market are Alcon, Bausch & Lomb, Inc, Johnson & Johnson Vision Care, and Abbott Medical Optics. Transparency Market Research (TMR) predicts that the global intraocular lenses market would expand at a steady CAGR of 5.20% during period between 2017 and 2024. Furthermore, the global market for intraocular lenses would reach a value of US$5069.5 mn by the end of 2024, rising up from a value of US$3553.4 mn in 2016. On the basis of geography, the market for intraocular lenses is projected to expand at a stellar pace in North America. The demand within the global market for intraocular lenses has been rising on account of the rising incidence of retinal disorders. Furthermore, the past decade has witnessed key advancements in the domain of ophthalmology, and several new treatment mechanisms and technologies have come to the fore. This factor has also played a crucial role in the growth of global intraocular lenses market in recent times. There is a high possibility of new growth avenues emerging in the global intraocular lenses market as people become more concerned about eye care. The market for intraocular lenses shall also reap in voluminous revenues as skilled doctors and specialists make their way into the global healthcare fraternity. The global market for intraocular lenses has been expanding at starry pace, but a number of trends could hinder market growth. Medical reimbursement policies across a number of regions exclude eye care or ophthalmology treatments. This factor could be a severe roadblock for the growth of the global intraocular lenses market. However, the decreasing prices of cataract surgeries and treatments would continue attract new consumers into the market. Moreover, promotional campaigns for eye care treatments have also emerged as a key prospect for the growth of the global intraocular lenses market. 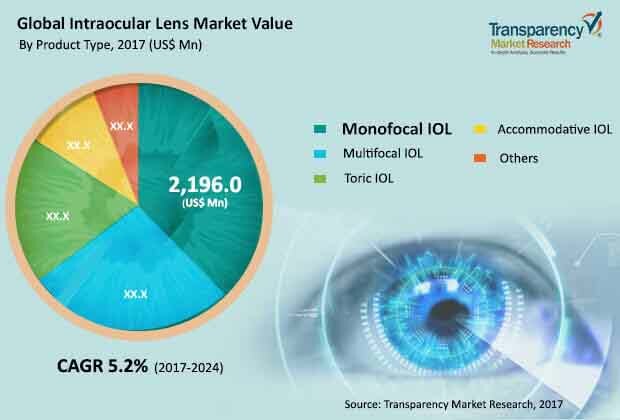 The review is based on TMR’s report titled, “Intraocular Lens Market (Product - Monofocal IOL, Multifocal IOL, Toric IOL, and Accommodative IOL; End Users - Hospitals, Ophthalmology Clinics, Ambulatory Surgery Centers, and Eye Research Institutes) - Global Industry Analysis, Size, Share, Growth, Trends and Forecast 2017 – 2024”.